With Airtel Night Plan users undoubtedly has been using it to make downloads as it's stand as the best in the last 3 months of 2019 where you can get 500mb for N25 and 1.5GB for N200 but a sad development broke out today 13th April 2019 as Airtel Night Plan has been silently Slashed. Airtel Night Plan works for user on the Airtel Smartrybe 2.0 which you will have to Subscribe. SmarTrybe 2.0 is a tariff plan that keep users connected to Trybe and according to Airtel you can only Enjoy Night plan when you migrate to Airtel SmarTrybe .2.0 and to migrate you will dial *312# and then Select 1 then patiently wait for their Service message from 141. 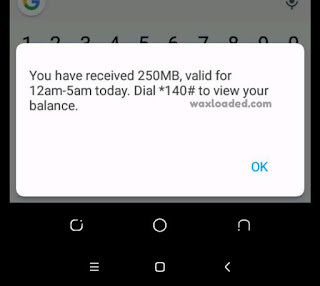 Both Airtel Night plan which was 500MB for N25 and 1.5GB for N200 has been Slashed to half of it's Data capped. This sad news broke out when some friend did the N25 for 500MB only to be give 250MB and although there is no more 1.5GB for N200, this has been removed from their MENU. As it's stand now am beginning to imagine this could be directive from NCC to Slashed out all Night plan because all networks now but particular these two telecos Airtel and MTN that has been fair with that Night Plan before has had the same share on the site for their Night plan as both now only activate N25 for 250MB on it's network. The question now is that who are those that to be blamed for the Slashed in Airtel Night Plan of recent, could it be NCC who are given the directives or the telecos themselves to reduce the users using their Night plan for browsing, it is something that is still yet to be unraveled.